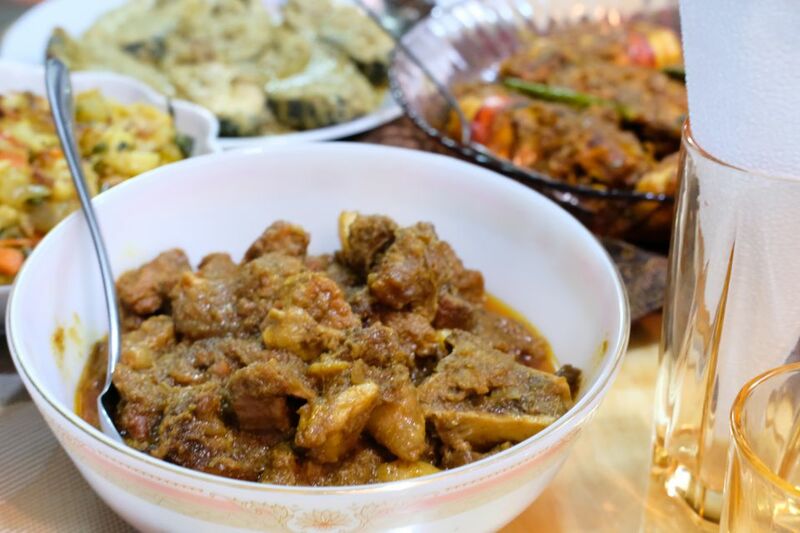 While beef and chicken are the most consumed meats in the world, lamb is popular for its versatility in dishes. This Jamaican-inspired, curried lamb stew adds heat and extra savory flavor to a traditional lamb stew recipe, featuring cubed boneless lamb and spices for a stew the whole family can enjoy. Prep the stew in the morning and come home to a dinner that is best served over rice, couscous, mashed potatoes, or even polenta. Sear lamb cubes over medium-high heat in a skillet with 1 tablespoon of oil until browned on all sides. Add seared lamb to the slow cooker. Cook onion in the remaining 2 tablespoons oil in the same skillet until soft, but not brown. Add onions to the slow cooker. Remove skillet from heat. Add 1/2 cup stock to the skillet and use a wooden spoon to loosen any leftover onions. Add the stock to the slow cooker. Add remaining ingredients to the slow cooker, stirring to combine. Cover and cook on low heat for 8 to 10 hours. Discard habanero before serving. When buying lamb specifically for stew, forego the expensive lamb chops. You want your lamb meat to come from the shoulder area, such as shoulder arm picnic, arm roast, blade roast, and blade steak. These cuts are actually cheaper to purchase than the leg of lamb, lamb roast, or lamb chops. This meat is well-suited for the long cooking times and is heartier than the other cuts. You may also find a boneless lamb that has already been cubed at specialty grocery stores or farmers' markets. Lamb stock may be hard to come by, but it can be found at specialty grocers and even online. Lamb bouillon, however, is more readily available, found at most national chain grocery stores. You may also use chicken stock (store-bought or homemade) for this recipe, but lamb stock will give the dish a deeper flavor. Be careful with the habanero pepper; wear gloves when working with it. Use a smaller amount if you aren't accustomed to hot and spicy food. Replace the habanero with a milder chili pepper, such as a jalapeno, red Fresno, or serrano. A Little Rum and Lager in Your Jamaican Jerk Chili?